Nokia 3310 and 3 news Nokia Android smartphones are now official in the Philippines. 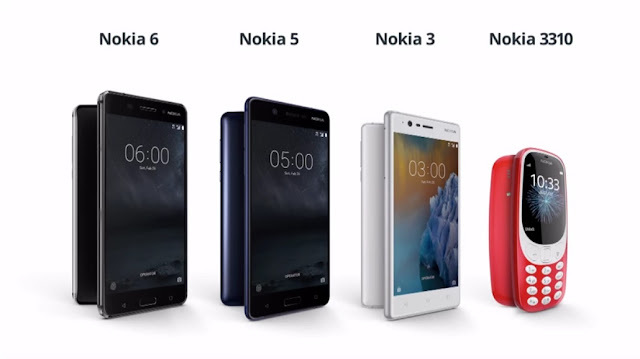 Nokia under the licensing of HMD Global released three new smartphones and the reimagined Nokia 3310 smartphone in the Philippines. Nokia 6, Nokia 5 and Nokia 3 enters the country's highly contested mid-range market with Android mobile operating system. The Nokia 6 leads the pack with its Qualcomm Snapdragon 430 chipset which features an octa-core processor and Adreno 505 GPU. It is framed with a 5.5-inch full HD display with 2.5D glass treatment. It also packs 4GB of RAM for faster multitasking activities and 64GB of native storage. The Nokia 5 has the same Snapdragon 430 SoC but it comes with a smaller footprint. It features a 5.2-inch IPS LCD display and 2GB of RAM. It aces the Nokia 6 with its slightly updated version of Android Nougat 7.1.1. The Nokia 3, on the other hand, is powered by a MediaTek MT6737 chipset with quad-core processor and 2GB of RAM. It sports a 5-inch IPS LCD display and boots with Android 7.0 Nougat. The ever popular Nokia 3310 comes alongside its bigger brothers with a price tag of Php 2,490. The Nokia 6, 5 and 3 comes with an asking price of Php 11,990, Php 9,990 and Php 6,990, respectively. The handsets will be available by the end of June.